I sometimes heard people complain about them, but noone seems to have been bothered enough to change them, so I decided to. There are two mods here. 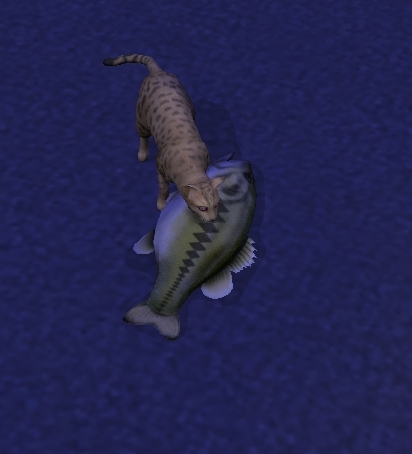 Your sims can catch a fish that will feed 6 people, but the same fish will never fill a cat up more than halfway (even when the fish looks bigger than the cat). The first mod changes that so a fish will fill the cat's hunger metre all the way up. Due to the length of time the animations run for, if your cat's hunger bar was over halfway full then they will keep eating for a bit even after the bar is full (but cats can't get fat anyway). Even if you've bought your pet the highest quality pet bed stuffed full of cushions, when a toddler sleeps there it gives them really crappy energy gain. I timed a toddler with a depleted energy bar and it took them 10 hours to get fully rested. This mod increases the energy gain and reduces the time to between 5 and 6 hours. The mods are global mods, so should affect all the different types of fish and all the different pet beds. They overwrite the eat interaction for cats eating fish and the sleep interaction for toddlers in pet beds, so will clash with anything else that also alters these. Both mods require Pets, the cat eating fish one also requires Seasons and I have been informed that toddlers sleeping in pet beds wasn't added until AL, so that one will require AL. 181 people have said thanks to Charity for this download.